How do you know a run blogger ran a marathon? 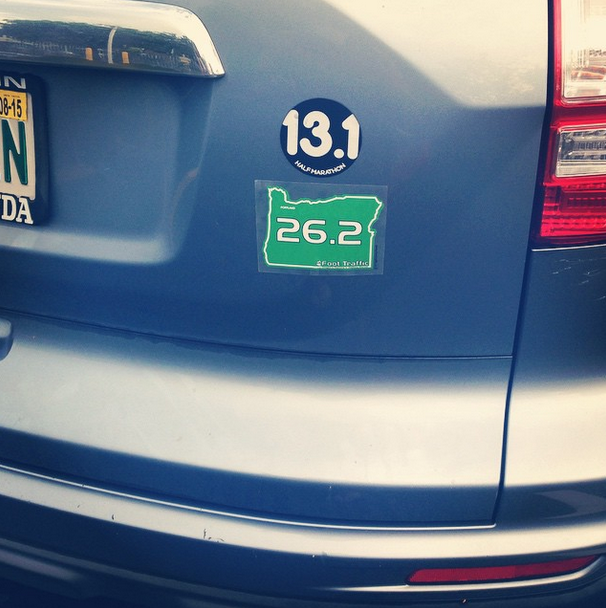 She’ll post about it every single day for a year and put a giant sticker on her car : ) I promise this is my last marathon related post for a little while! I finally got around to syncing my Garmin last night and found that the total elevation gain in Portland was over 700 feet!!!!!! In hindsight I should have realized that there is no flat course in the Pacific Northwest. I guess I just romanticized the idea of running in Portland once I read about the race and completely ignored common sense! Oh well! When I first crossed the finish line Adam made sure I was comfortable and told me jokes to distract me from my sore legs. He did and said all the right things which included not sugar coating what had happened out there on the course since we both knew I had not met my expectations. While we were still sitting yards from the finish line, Adam told me he was proud of me for finishing but asked what I would do next to improve. Instead of letting me dwell on the negative, he forced me to think towards the future. It occurred to me in Portland that I had very little experience coming into the marathon with just two half marathons and a handful of 5Ks under my belt. I believe that the stronger and faster I get at the half marathon distance, the more enjoyable the full marathon distance will be when I tackle it again next year. I want to get as close to a 2:45 half marathon as I can before my next full. I honestly don’t care if that is an official race time or something that happens during training. More than likely it will happen during training as I don’t think I will reach that goal this winter. My fastest half marathon to date – happened in the middle of marathon training on tired legs – and was 3:04 (14:02 pace). While I’m running the Nov. 9th Fort Lauderdale half for fun, I hope to run a 2:59 (13:39 pace) or better half marathon in December at the Palm Beaches half. If that doesn’t work out I’ll try again at the Miami Beach half at the end of January. Palm Beaches will literally be the first distance race I will actually run for time. While I always have expectations for my running events (like the marathon), I have never really PUSHED myself to reach a certain time goal. I’m excited to enter a race with a completely different mindset and see what happens! Portland gave me the confidence in my mental ability to push through hard times. Until Sunday I didn’t think I was a very mentally tough person, but now I’m pretty sure I am. I’ve been a runner for almost two full years and I finally feel ready to take it more seriously. I think I’ve always said I was not interested in time or pacing because I had no faith in my abilities, but I want to spend the next year building up my running confidence! I feel ready! Portland wasn’t my perfect experience, but I sort of feel like if I could finish that I can do anything! Maybe it was just what I needed after all. What is your big fall / winter goal this year? New Distance? PR? My big goal this fall/winter is to run my first full marathon, which takes place in Florence, Italy on November 30th (the day before my birthday omg). I’m super excited about that! Another one of my goals for the winter is to not slack on my running just because it’s freezing cold – last winter was so bad for me, ugh.. I hate treadmill runs, but it’s better than nothing. I see you are very interrested in ultramarathons. So I’d like to recommend this really great documentary I saw on the plane to New York in June (wow, haha, how am I able to put so much unnecessary info in a simple comment?!). It’s called “Desert Runners”. I think you’d enjoy it! I thought it was amazing. Keep up the great work, you are a huge inspiration! HI Marie!! I am sorry to hear that your computer stopped working and I hope you’re able to get your blog up soon because I want to read all about your first marathon!!! So exciting that it’s right before your birthday! I have seen Desert Runners! That documentary was my introduction to ultra running. I had no idea the sport existed before I saw the film! So cool that they showed it on your plane ride! Keep me updated on your training leading up to the marathon 🙂 I want to hear all about the final weeks! If you run 26.2 miles you’re allowed to post about it all you want =). I want to do a spring marathon and get a new PR half-marathon!! Oh, I had no idea you were planning to do a spring marathon – SO EXCITING! 🙂 I bet you will get a new half marathon PR during marathon training! Please keep the marathon posts coming! We love to hear about it. I also love reading about your goals because it motivates me to set goals. Obviously I am doing my 10k this October. I am thinking it would be cool to back off from speed over the winter and work on distance. Do some long, hilly runs. I used to have this really good system- I had an awesome 9 mile route and an awesome 15 mile route which were both hilly. I would alternate those long runs- one weekend the 9 and one the 15. It really got my fitness base up there. If I can increase my base, and then add some speed, I’d like to try to PR in a half this spring. Then maybe a marathon?? I am getting the marathon bug reading everyone’s re-caps!!!!!!!!!!! Yes!!!! I am so excited that you’re thinking about signing up for some races! I loved tracking you during the Boston Marathon this year and you were just doing that one for fun. It would be so awesome to follow your training for a marathon that you’re doing for time! It’s great that you’re already looking ahead, and I think you have the dedication to keep working at your goals. My issue is always consistency, so that’s what I’m striving for. I love the posts around marathon thoughts and look forward to hearing about more of your distance running (halfs and beyond). I’m running my second half marathon this coming March, and I have this BHAG of running a marathon in the fall of 2015, so I could use the motivation! Hey Jess! I hope you do go for the marathon in fall 2015 so that we’ll be training at the same time! I really found that reading the blogs of other runners training for a marathon this summer helped me stay motivated. It felt like we were all going through the same things together! I am most definitely looking forward to reading about your half marathon training this winter! I haven’t thought too much about goals past my marathon…Right now I am feeling like focusing on 1/2’s maybe for time. We will be entering our “off season” here due to winter. I love how you are always setting goals. Prior to this year I have always been afraid of setting goals, I still am, but it does give training purpose (rather than running to finish a race). I think you should post all you want about the marathon–this is for fellow runner geeks–we love this stuff! I’ve always been afraid of setting time/pace goals, too. It’s much easier to set distance goals because all you need is time and a little dedication to reach those. Running fast requires something that I sometimes wonder if I even have! Haha I will be talking about my marathon until the day I die! 🙂 I also cannot wait to slap that 26.2 sticker on my car! The Key West marathon would be so fun- I would love to do that one! I really want to PR my half marathon in March! Hahaha I feel like it’s ALL I’ve been talking about with anyone who will sit still to listen for a minute! My turn at the mike is coming to an end though, next week is all YOURS! Also, you should totally plan to come down and do the Key West Marathon next year! Can we request the marathon posts to keep coming lol. I love the plans, I often think that after I finish a big race that I’ve been planning for a long time ill throw my hands up and say “ok now what? ?” New goals keep you motivate and keep you striving to improve. Can’t wait for the ultra posts to start happening. We have two races a month from Oct – Dec. A half in January then the MARATHON in February! Ahhhhhhhhhhh it’s getting close lol!! WOW two races per month!! I would like to do more races each month but there are only so many weekend days I can sleep in during a month and giving up more than one of them is tough for me :). That’s so exciting that your marathon is coming up so fast now! You are going to do ridiculously well! I love that you are still talking about and processing your marathon. Fun to hear all of your thoughts on the race! Love you plan going forward. Thanks, Kim! I feel sort of like all I keep saying is “it was hilly, it was hilly, it was hilly” like a broken record! I’m glad it’s not becoming *too* annoying! Girl, you ran a marathon – talk about it for the next 10 years! My big winter goal is to run a half marathon! So exciting that your first official race is just around the corner! And then the half marathon!!!! Keep talking marathon all you want “) I am very nervous to try to tackle that distance. The more you talk about it the more I think about doing it! I think running a lot of half’s is a great plan. I don’t race much at all!! I wish I could do more. 700ft. is a big gain! my hills around max out usually around 300ft. elevation. there are several along my runs, but i do have routes that I can avoid running them over and over on. The chart was really off, a hill that big is kind of a cruel surprise. Great job toughing it out! I hope you decide to tackle 26.2 miles. With your determination I know you would tackle the distance with total grace AND your hubby could bike along the course cheering you on! I love that idea Kristina 🙂 Wait till I tell hubby he may have to bike the marathon course next year!! So awesome that you ran your first marathon and continue to make goals!! I am running my first next April. Until then I plan on running another half…maybe more. And working on getting more speed. If you stick with your plans a keep pushing you will surpass your goal of 13:39 pace!!!! I started running by feel more often and have seen a lot of speed improvement! Hi Staci! How exciting that your first is coming up in April! I just subscribed to your blog so that I can follow along and stay motivated! Love that you’re building your confidence! This is something I’m still working on because my first half marathon didn’t go as well as I’d expected. I’m a bit scared to attempt another! Do you run alone or with friends? I have no active friends and find it can be hard to stay on track by myself. You absolutely deserve to brag and talk about 26.2 as much as you want! And yes, unfortunately there are no flat marathons in the Pacific NW. I wish. I don’t think the first race of any kind can be the perfect race. I always think of the first as a great learning experience and baseline. Now that you have the tools and know what to expect, you can make adjustments and set new goals. We all have to start somewhere. During my first marathon, I ran into a stranger’s house to use the bathroom (it was SO embarrassing), but I learned never to pass up a porta potty. I’m so excited for you to start Full Ironman training! Your training recaps are always so motivational for me. It’s actually been your blog that has made me want to set goals to get my pacing down. I’m so inspired by how you’re always setting goals and meeting the challenges with total poise! Very interesting to hear that you think getting better in the half distance will help you in a full. I have run two halfs (my third is next weekend!) and debated running my first full next spring. But I also thought I should get better in the half distance and then run a full in 2016. Good to know I’m not alone in thinking this! I don’t know if running more halves will help me improve my full marathon time but I do think it will make the full feel more “comfortable.” I also want to keep a really strong long run base this winter and spring — something between 15 and 18 miles. It makes sense to me that the more I run distance the better I’ll get at it! 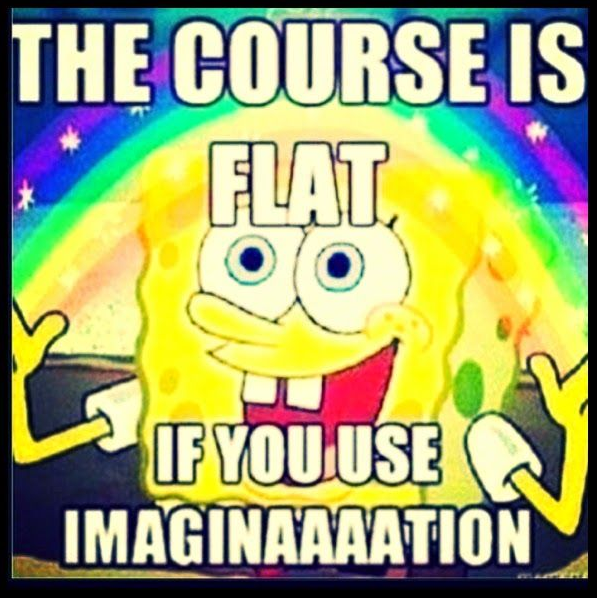 Plus, I just really love long runs … on flat roads! Honestly besides the cost, I chose a Florida marathon for my first because I know that the hills would be ridiculous anywhere else! I’m so happy you have more races set up, but I’m a little bit sad to see that the Sarasota race won’t happen! Please keep posting about the marathon!! I’ll never get sick of it! I haven’t completed counted out the Sarasota half yet, i’m just not positive it’s going to fit into my schedule with a couple of other things that have cropped up. I hope I can still do it! Really?! You have made such big improvements over the course of this year! That is very inspiring for me! With dedication i hope I can make the same improvements you did over the next year! I would be forever happy with breaking 2:30 too! Can’t wait for it to happen for you! I’d love to come run in DC with you, but I think it might be too hilly ;). Plus if we meet I might try to steal all of your cute clothes! I hope this isn’t your last post about the Portland Marathon!! There’s no way to process it all within just a few days. & I love the car sticker! Adam was a rockstar for being there at the end. An awesome Sherpa who knows you better than anyone else, knows your body language and that look in your eyes, that makes all the difference in the world. I signed up for my redemption run, LA Marathon 2015. I’m nervous about the work but excited to run the course again! I don’t think I could run long distances in FL. You may not have hills but the humidity is a beast! So exciting to hear you signed up for LA 2015!!!! You will get your redemption! 156 days to go (I know because I just checked out the race website, haha) :). Having Adam there at the finish line was everything I needed after a tough race! He always knows exactly what I need to hear and in what order. First the jokes to make me laugh and then the questions about getting better! You will need to blog about your first marathon sometime, I would LOVE to hear about it! The ultra will be coming! I thought I would get in the 50K next year, but I really want that to be a special race where I don’t feel like I’m dying through the entire second half, so I think I’ll need to push it back a couple of months into early 2016. It’s a test of patience for me since I am so anxious to add an ultra to my race list! LOVE the new car sticker!!! My poor civic that I recently lost had 3 of my running stickers on it. 🙁 Two were from Boston 🙁 🙁 I never stop talking about my marathon once I’ve run it…lol. Sometimes even I think I sound crazy.